November 12, 2012 March 24, 2017 Carl 'The Disc' Fisher 0 Comments Discworld, discworld 2 missing? Presumed! The game that started my long time love affair with Terry Pratchett’s Discworld series first came to my attention in the mid-nineties. Before getting my grubby little mitts on this I had never really played a point & click game before. To be honest the style of these sort of games had never really appealed, they seemed to slow for my liking. Folks talk of growing up with the Monkey Island series, I didn’t, so a point ‘n click games was very foreign to me & I saw no reason to actively seek one out. However thorough a couple of swaps at school I ended up with a load of PlayStation games one of which was Discworld 2: Missing? Presumed. That cover intrigued me from the start, it is bright & colourful (I have a lot of love for colourful games) & there is a lot going on, of which I knew nothing. 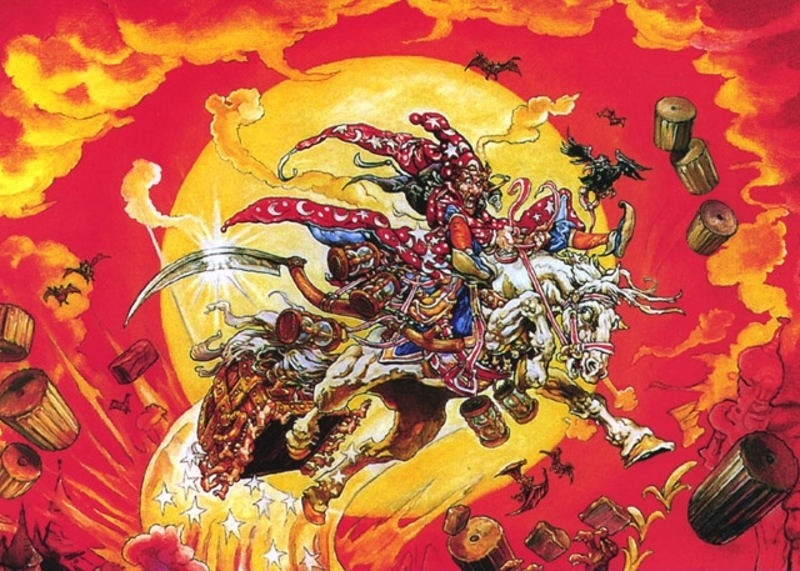 I had never even heard of the Discworld series so nothing made any sense to me at first. The opening movie? 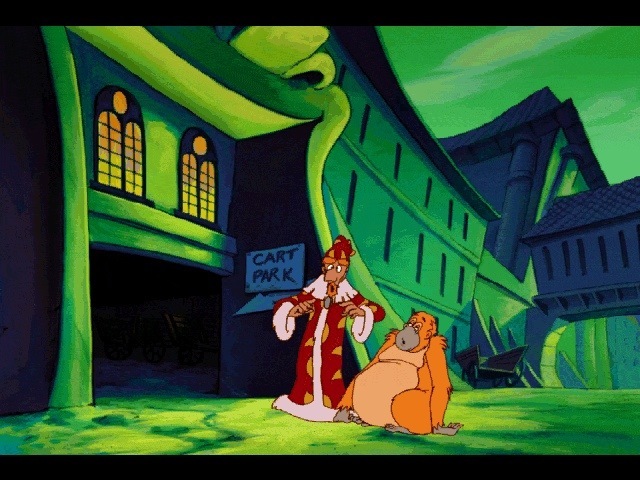 Why was this man in a dress who sounds a lot like Eric Idle talking to a monkey? Have they been drinking? Is that a bomb? Oh yes….to all of the above (except the monkey part, he is definitely not the M-word). I quite liked the references to the fact that it was just a game, it made It all just that little bit extra silly & silly it was. From the moment Windle Poons the wizard died & reanimated as a zombie (which he was not happy about) I knew this game was far from serious. After witnessing Windle reviving & smashing his way out the other wizards call upon the lowly failed wizard Rincewind to do much collecting of items & talking to people just to find out where Death has gone. 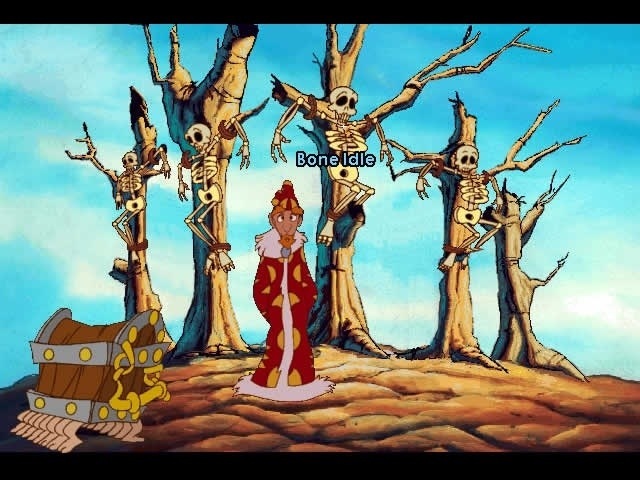 That is the game in a nutshell, You control Rincewind exploring sections of the Discworld to find out where Death has gone & then bring him back. Throw in a healthy amount of book references/sections & you have the 2nd Discworld game. It’s a game that is all plot & very little action with the progress being made by taking to characters & dealing with their needs or getting rid of them. 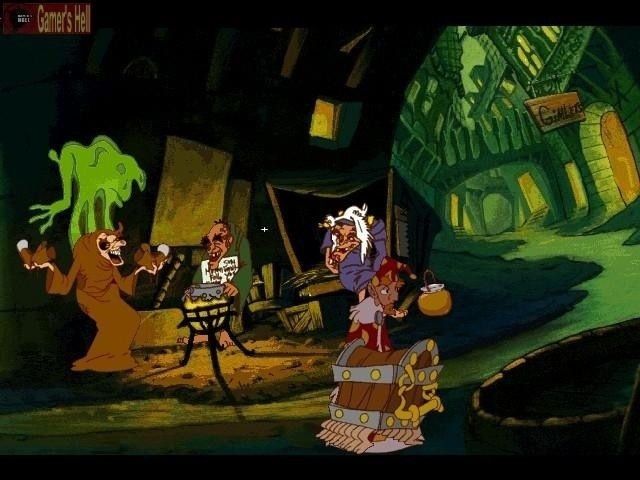 I love it because it is so well scripted, it’s funny, great looking & it introduced me to the Discworld. Every section of the world you do visit has its own charms but stepping into Deaths land really put a smile on my face, it is everything you would expect from Death’s home. The game isn’t an easy find on consoles anymore & fetches upwards of £20 just for the PS version but you can find it pretty cheap on PC. Make sure you pick up the strategy guide as well as it comes with a lovely map of the Discworld. Oh & read the books! ← Previous Top 10 things you had to see/do in Shenmue! Where as I grew up with monkey island and the other summvm games but I never played this. Me thinks ill pick this up. It has great humour & looks lovely.